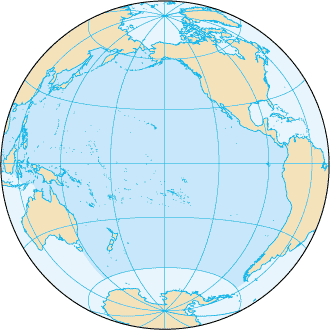 The Pacific Ocean is a ocean between Asia, Australia, North America, and South America. It is the largest ocean in the world. Many nations have coastlines on the Pacific Ocean, including Russia, the United States, Canada, Mexico, Guatemala, Honduras, Nicaragua, Costa Rica, Panama, Colombia, Ecuador, Peru, Chile, Australia, New Zealand, Indonesia, Vietnam, China, North Korea, South Korea, and Japan. Several cities are located on these coastlines, including Vancouver, San Francisco, Los Angeles, Lima, Santiago, Sydney, Tokyo, Seoul, Beijing, and Shanghai. The Pacific Ocean was not frequently traveled for much of history, outside the Sea of Japan where Chinese ships frequented. However, the southern part of the ocean is dotted with islands, and early Polynesians often canoed or surfed among these islands. A few explorers traveled the ocean in the Age of Exploration, but the area did not see much traffic until the Industrial Revolution, when the slow boats began running from San Francisco to China. In the Second World War, the Pacific Ocean was the Pacific Theatre and the site of all the battles between the United States and Japan. Japan had built an empire in the northwest Pacific Ocean, but the United States conquered it. Today the ocean is crossed by various trade ships connecting the Far East (China and Japan) with the United States. The Pacific is connected to the Atlantic by the Panama Canal. This page was last edited on 6 May 2017, at 23:32.